Southern California’s Caleb Paine and Charlie Buckingham are among those eligible for the national roster. 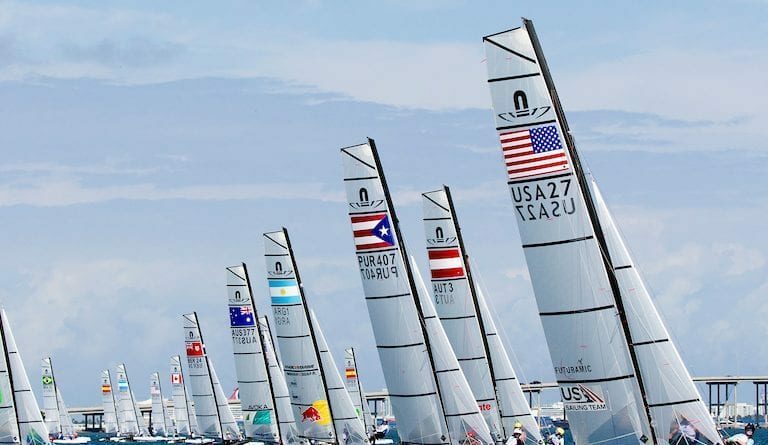 MIAMI, Florida—The list of sailors who’ll represent the United States in sailing event at the 2020 Olympic Games in Tokyo, Japan is starting to take shape, as Caleb Paine and Charlie Buckingham, among others, qualified for the 2019 U.S. Sailing Team after competing in two Hempel sailing events in Aarhus, Denmark and Miami. Buckingham, who is from Newport Beach, qualified for the 2019 U.S. Sailing Team after performing well in the Laser Men’s One-Person Dinghy at the 2018 World Championships Aarhus. San Diego’s Paine also qualified in the Finn Men’s One-Person Dinghy at Aarhus. Those who qualified for the 2019 U.S. Sailing Team does not mean they formally made the roster. Individual sailors from 49er, RS:X Men’s or RS:X Women’s have not yet earned a selection to the 2019 U.S. Sailing Team, though these classes could be filled later this year, according to a statement issued by U.S. Sailing. Muller and Railey earned bronze and silver medals, respectively, at the 2019 World Cup Series Miami event, Feb. 3.